The long and tumultuous history of asteroid (21) Lutetia is revealed by a comprehensive analysis of the data gathered by ESA's Rosetta spacecraft when it flew past this large main-belt asteroid on 10 July 2010. New studies have revealed the asteroid's surface morphology, composition and other properties in unprecedented detail. In particular, extensive studies of Lutetia's geological features have opened a unique window into the complex history of this peculiar object. The first results from the flyby, published in late 2011, revealed the mass and volume of Lutetia, leading to an estimate of the asteroid's density, which turned out to be surprisingly high. Data from the flyby also suggested that Lutetia is a primordial planetesimal formed during the very early phases of the Solar System. These and other findings called for further investigations about the nature and history of Lutetia. "The images collected by Rosetta during the flyby have uncovered, for the first time, the wide variety of craters and other geological features that scar the surface of Lutetia," notes Rita Schulz, Rosetta Project Scientist at ESA. "Scientists have explored this rich pool of data thoroughly in order to characterise many of Lutetia's properties, from its surface morphology and composition to its shape and internal structure, revealing its underlying geological history," she adds. The results of these studies are reported in a series of 21 papers published in a special issue of the journal Planetary and Space Science. The OSIRIS camera on Rosetta has surveyed the part of Lutetia that was visible during the flyby – about half of its entire surface, mostly coinciding with the asteroid's northern hemisphere. These unique, close-up images have allowed scientists to identify regions characterised by very distinct geological properties with an accuracy of a few hundred metres. Counting craters is a powerful tool that is used to compare the regions and to uncover their past history. By recording the number, spatial distribution, shapes and sizes of the hundreds of craters that mark the surface of each region, it is possible to date the epoch when these craters were produced by collisions with smaller bodies. In the case of the largest craters, it is even possible to reconstruct the details of the impact that created them. By tracing craters and other features on Lutetia's surface, scientists have put together a geological map for the asteroid. Their studies have shown that Lutetia's surface comprises regions spanning a wide range of ages: each of them reveals a chapter in the long and tumultuous history of this asteroid. At one end of this age spectrum, the two heavily cratered Achaia and Noricum regions represent the most ancient portions on the surface of Lutetia: with ages between 3.4 and 3.7 billion years or more, they are almost as old as the asteroid itself. Some of the craters that densely populate these two regions date back to an early epoch in the Solar System's history, right after the so-called Late Heavy Bombardment, when the flux of bodies impacting asteroids, planets and their satellites was significantly larger than it is at present. Massilia, the largest crater identified on the asteroid, is located in a younger region named Narbonensis. With a diameter of 57 km, this crater provides evidence of the most dramatic event in the history of Lutetia: numerical simulations suggest that the 'projectile' responsible for producing this very wide crater was quite large, with a diameter of about 7.5 km. However, the probability of such a large body colliding with the asteroid is quite low, and so this must have occurred when Lutetia was relatively young. Simulation of the formation of a large crater on Lutetia. The youngest patch on the surface of Lutetia is the Baetica region, located in the vicinity of the asteroid's North Pole. This region hosts a number of superimposed craters, named the North Polar Crater Cluster (NPCC), which include three large ones with sizes exceeding 10 km. These craters represent the signature left by a series of subsequent impacts that took place quite recently on geological timescales – namely, in the last few hundred million years. The smooth appearance of the craters in Baetica, which have not been dotted yet with many smaller craters, indicate that its surface is much younger than the heavily battered areas of Lutetia. Furthermore, this region still bears signs of the events that created the NPCC, as indicated by the ejecta that were released during the impacts and then spread on the surrounding area, rather than leaving the asteroid's surface, as a result of its relatively strong gravitational pull. The presence of these 'fresh' deposits, which include many large boulders with sizes up to 300 metres, is another hint at this region's young age. In addition to craters, other geological markers, such as lineaments and faults, represent an important window into the turbulent past of asteroids and other Solar System bodies. The remarkable images collected by OSIRIS during the flyby have revealed an intricate network of linear features covering long distances across Lutetia's surface, up to 80 km in some cases. Many of these features are the results of seismic phenomena that also caused deformations on pre-existing craters. Lineaments and faults have been mostly detected in the oldest portions of Lutetia's surface. In contrast, a lack of such features in the young region near the North Pole suggests that the recent impacts that gave rise to the NPCC did not cause significant fractures on the surface of the asteroid. Prior to the flyby, one of the most puzzling aspects of Lutetia was its surface composition: different datasets have hinted at either a metallic or a chondritic composition, thus making the classification of this asteroid particularly problematic. Scientists have now addressed the issue by combining data gathered with four remote-sensing instruments on Rosetta – OSIRIS, VIRTIS, MIRO, and ALICE – which cover visible, infrared, microwave and ultraviolet wavelengths. 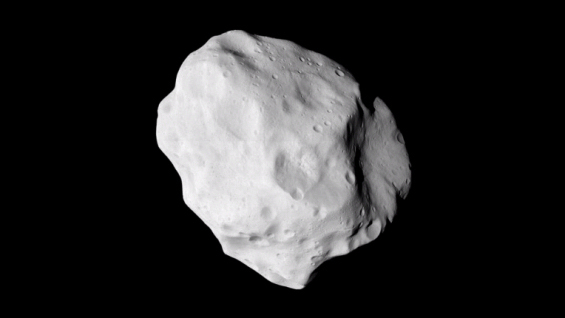 The new data show that Lutetia has an unusual surface composition that does not fit into the schemes established before the flyby and may result from the complex collision history of the asteroid. The flyby of Lutetia also provided a rare opportunity to obtain 'in situ' measurements of the surrounding environment of the asteroid, allowing scientists to search for an exosphere, an internal magnetic field or satellites. All three searches did not find significant evidence for any of these possibilities, and could only set upper limits. "The data collected during Rosetta's flyby of Lutetia have provided us with a brand new view on this intriguing object," comments Schulz. "I expect that scientists will continue to investigate these unique and extraordinary data for years to come, pushing forward our knowledge about this asteroid and its origin, and revealing new details about the Solar System's past history," she adds. In the meantime, Rosetta proceeds towards its final destination, comet 67P/Churyumov-Gerasimenko, which will be reached in 2014. "We are eagerly awaiting the next and probably most exciting phase of the mission," concludes Schulz. On its 10-year journey towards comet 67P/Churyumov-Gerasimenko, ESA's Rosetta spacecraft has flown past two main-belt asteroids: (2867) Steins in 2008, and (21) Lutetia in 2010. The flyby of Lutetia took place on 10 July 2010, when Rosetta flew past the asteroid at a distance of 3168.2 km and at a relative speed of 15 km/s. Most of the scientific instruments on Rosetta were switched on as the spacecraft approached the rotating asteroid, resulting in imaging and spectral observations covering a spectral range from ultraviolet to microwave radiation, and a number of in-situ measurements of the asteroid's environment. The Optical, Spectroscopic and Infrared Remote Imaging System (OSIRIS) returned 462 pictures of the illuminated northern hemisphere of Lutetia through both its narrow-angle camera (NAC) and wide-angle camera (WAC). These images cover more than 50 per cent of the asteroid's surface and were instrumental in revealing its surface in unprecedented detail. The ALICE, VIRTIS and MIRO instruments were used to gather spectra at ultraviolet, infrared and microwave wavelengths, respectively, in order to probe the chemical composition of Lutetia's surface. In-situ searches for an exosphere were conducted with the ROSINA instrument; spectra from the COSAC/Philae, Ptolemy/Philae and ALICE instruments were also used to search for the asteroid's exosphere. Magnetic field measurements were performed with the ROMAP, RPC-MAG/OB and RPC-MAG/IB sensors.